2019/4/1, New year has started. Members updated. 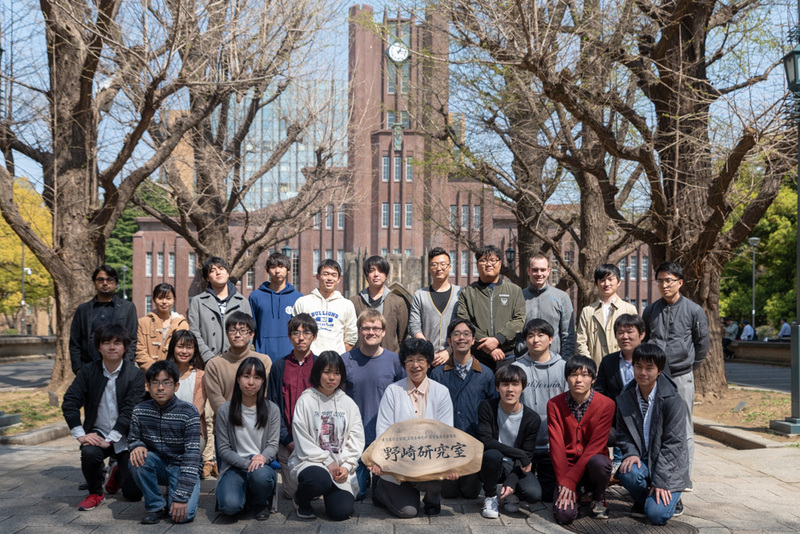 2019/3/21, we held an alumni party on 15th anniversary of the Nozaki group.Photos updated. 2019/2/22, Assoc. Prof. Takanori Iwasaki has been awarded the The Japan Petroleum Institute Award for Encouragement of Research and Development. 2019/2/9, The birthday party for Prof. Nozaki was held. Photos updated. 2019/1/4, Assoc. Prof. Takanori Iwasaki has been awarded the Thieme Chemistry Journals Award 2019. 2019/1/1, Project Assist. Prof. Shrinwantu Pal has joined the Nozaki Group. Members updated. 2018/12/26, we joined the rice cake making party. Photos updated. 2018/12/7, Assoc. Prof. Takanori Iwasaki has been awarded the Incentive Award in Synthetic Organic Chemistry, Japan. 2018/11/21, Prof. Joost Reek (University of Amsterdam) gave a lecture. Guests updated. 2018/11/19, Mr. Yuki Tokimaru won the best poster prize at IFOC-9. 2018/10/29, Prof. Kyoko Nozaki was awarded the The Karl-Ziegler-Guest Professorship and delivered a lecture at Max-Planck-Institute für Kohlenforshung, Mülheim. Photos updated. 2018/10/25, Prof. Bin Tan (Southern University of Science and Technology) and Prof. Martin Oestreich (Technical University of Berlin) gave lectures. Guests updated. 2018/10/16, Assoc. Prof. Takanori Iwasaki has been awarded the Chemist Award BCA 2018. Photos updated. 2018/9/24, our paper [Organometallics, 2018, 37, 3001–3009.] was featured on the cover. 2018/9/1–2, we went on a lab trip. Photos updated. 2018/8/10, Prof. Christophe Copéret (ETH Zurich) gave lecture. Guests updated. 2018/8/6, Prof. Blanca Martin Vaca (Paul Sabatier University) and Prof. Arjan W. Kleij (Institute of Chemical Research of Catalonia) gave lectures. Guests updated. 2018/8/1, Dr. Megan Hill has joined the group. Members updated. 2018/7/13, Falk Seidel won the poster prize at ISHC 2018. 2018/7/2, Assoc. Prof. Takanori Iwasaki has joined the Nozaki Group. Members updated. 2018/5/29, Dr. Andreas Phanopoulos was interviewed by Chem-Station about his experience in Japan. Why Don't You Study in Japan? 2018/4/28, a BBQ party was held with the Sando lab. Photos updated. 2018/4/2, Dr. Shingo Ito has been promoted to Assistant Professor at Nanyang Technological University to lead Ito Group. Congratulations! 2018/4/1, New year has started. Members updated.